It is cold here this morning! Minus 13 right now. Hope you are staying warm today! Following is a repost because I believe that this principle can greatly improve a person’s effectiveness. 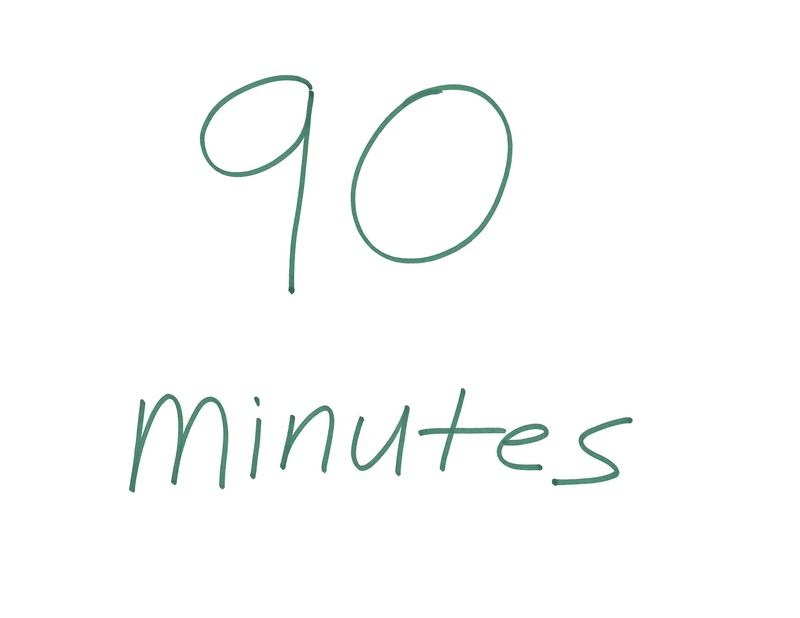 What is so key about 90 minutes? This is a number that I have been encountering over and over the last couple of years as I have been learning more about personal and organizational productivity. For instance, in learning about effective meetings, it has been demonstrated that you should never have any meeting segments that last more than 90 minutes. That is as long as someone can effectively maintain focus. Apparently, another factor is that the way most of our bodies work – our cycles – after 90 minutes it is good to have some healthy nourishment. So a having a healthy snack in the meeting available after that 90 minute break is helpful. Here at our ministry, we are teaching the 90 minute “rule” for our extended meetings. My main point today, however, is some research mentioned by Tony Schwartz in his book The Way We’re Working Isn’t Working as well as by Malcolm Gladwell in his book Outliers. Schwartz however illustrates a point not mentioned by Gladwell and that is the tremendous impact of working in cycles of intense focus for 90 minutes and then taking some kind of “renewal” break and then returning for an intense focus of 90 minutes and so on. The research that Schwartz and Gladwell both are referencing is from a study by Dr. K. Anders Ericsson of Florida State University on violinists and the impact of practice on their levels of achievement. One aspect that he discovered is that the truly great violinists typically worked in cycles of three focused practice sessions of 90 minutes each day with renewal breaks between each session. The truly great violinists also averaged an almost an hour more of sleep a day than the only average violinists. The principle that we need to apply in our lives that should enhance our productivity, is to understand our need for short (90 minutes) periods of intense, uninterrupted focus with short renewal breaks between these periods. So, when you set your priorities for the day, make sure you set aside these times of focus, when you shut off your e-mail, put your phone on “do not disturb” and truly focus on the priority at hand. Then, after that 90 minutes, get up, get a healthy snack, walk outside if you are able to do so, or take some time to pray, get refreshed and then head to your next priority. I believe you will be amazed at how much more effective you become. But be warned – changing your work habits is not easy – but well worth the effort. Questions – what are some of your methods of achieving uninterrupted focus on your work? Do you believe that you are being a good steward of the time the Lord has given you to do His work? Hope you are having a blessed day today!